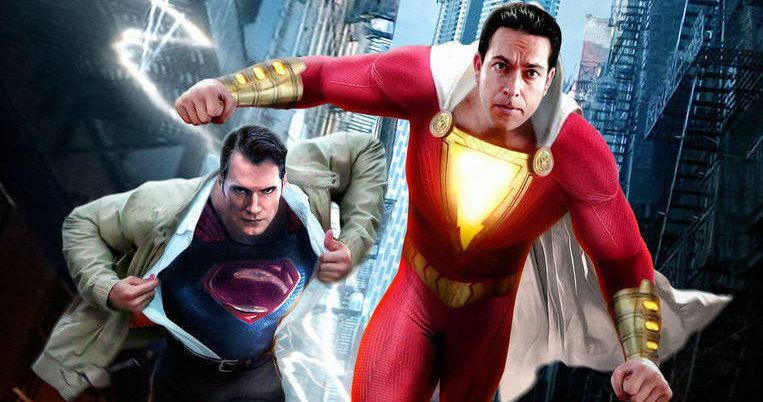 New Shazam Trailer Description Includes Big Tribute to Superman? Someone has apparently seen the new Shazam! trailer that is reportedly set to debut sometime this month. And not surprisingly, it will contain a big tribute to the Man of Steel himself, Superman. A description of the full trailer has leaked online, offering fans a taste of what they can expect to see in the next footage. Aquaman is a huge hit for Warner Bros. and the DCEU in general, with the movie surpassing Batman V Superman at the worldwide box office. DC Films hopes they can keep the momentum going with Shazam, which is in theaters April 3. We haven’t seen too much from the movie since the first trailer debuted at Comic-Con this past summer. Now that is about to change in a big way. If you want to come at the all-new Shazam trailer with a fresh set of eyes, then you might want to avoid the rest of what I’m about to say, because there will definitely be spoilers. Some reshoots have taken place since the first sneak peek dropped in San Diego, so we’ll definitely be treated to something substantially different than what we were shown the first time around. The new trailer shows Billy Batson enjoying dinner with his foster family. Victor Vazquez, played by Cooper Andres, tells everyone that a suited and booted hero has appeared in the Philadelphia area. This cuts to a montage of the best moments we saw in the original teaser, before the WB, New Line and DC logos triumphantly flash across the screen. The action then returns to the dinner table scene, where we meet Darla Dudley and Pedro Pena. The kids really have a go at Shazam’s colorful costume, mocking the new hero on the scene. Things transition to the Wizard’s layer from the first trailer, and Billy is once again seen getting his super powers. Freddy and Billy have a scene where they brainstorm superhero names, but each name is a big dud, intentionally falling flat for laughs. Billy is then seen attempting to soar above the clouds. This is where the big Superman moment comes in. Billy falls at a fast rate of speed. Turning in the air, he emulates his favorite DC superhero, channeling the Man of Steel in an iconic moment. Billy catches himself before making impact with the ground and it’s here that Shazam learns he can truly fly. Soon following this moment, Mark Strong makes his awaited arrival as the iconic Shazam villain Dr. Sivana. There is a scene of hero and villain fighting mid-air. This moment is intercut with two children playing with their Superman and Batman action figures. As Bats and Supes deliver plastic blows, we see Shazam and Sivana doing the same in real-life. The kid with the Superman toy is humming John Williams’ iconic theme from the 1978 movie, continuing to pay Clark Kent’s alter ego homage. This is called the highlight of the trailer footage. A second montage of scenes from the Comic-Con trailer play out. This leads to a scene where Freddy and Shazam are at a real estate office. They are on the search for a ‘lair’, and are interested in knowing if there are any ‘castles’ in the surrounding area. Preferably with a mote. The new trailer ends with Billy’s foster family confronting him about the real identity of Shazam. This is intercut with some intense action scenes. Just before the smash cut of the logo, Dr. Sivana asks Shazam how old he really is. Billy responds with, ‘Basically 15’. This is followed up with a shot of Billy transforming into Shazam after leaping off a tall building in a single bound. After the logo comes the stinger that most fans will be hungry for. It pays a Big homage to that Tom Hanks comedy classic from 1988. Sivana and Shazam are battling inside a toy store. Billy throws a large Batman action figure at the bad guy. It misses with a perfectly timed joke beat. Then we see Shazam land on a large scale piano as the two continue to fight. Warner Bros. and DC have not announced when the Shazam! trailer will makes its big debut, but it shouldn’t be too long now. As for cameos from actual heroes in the DCEU, it sounds like that will all be done in action figure form. This latest news comes from Super Bros Movies.